This is our elite ride where our top athletes strut their stuff. With top speeds and distances, you must be able to complete an OAS Lite ride easily in order to hang with this group. Routes will vary and are at the ride leaders discretion and may have shorter distance options, via route shortcuts. 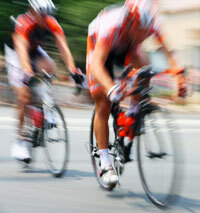 Riders must be familiar to, and practice safe pace line basics as all riders participate in the paceline. OAS Lite stops as a group for mechanical problems and flat tires. At least 1 rest stop on every ride. This is a "Drop" ride, so have a SAG plan. Riders should arrive at the lot 15 minutes before departure time to sign the PBA ride waiver and listen to pre-ride announcements.